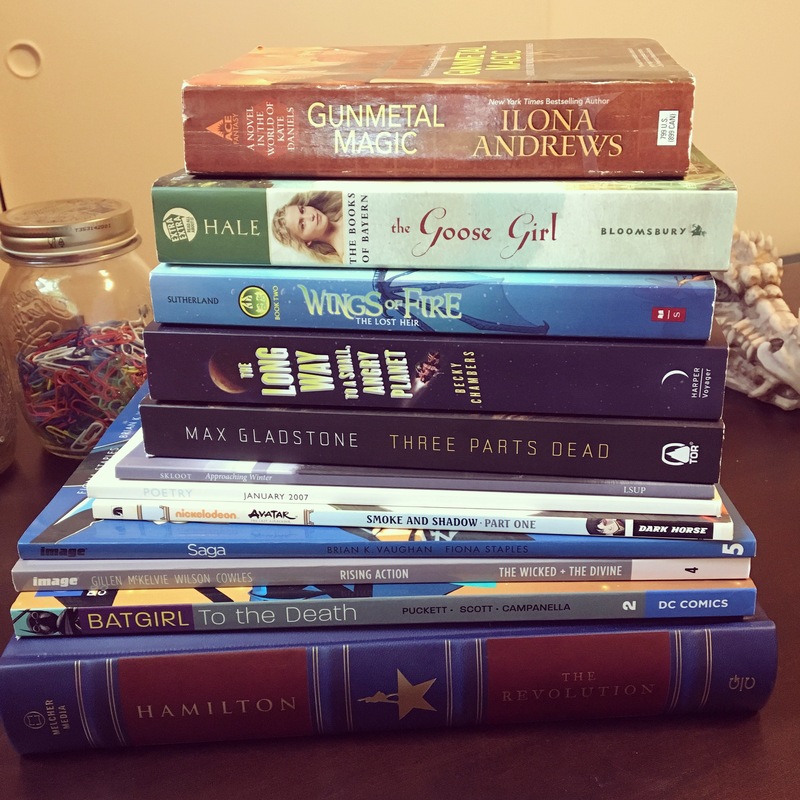 My stack for this readathon! It is too ambitious as is tradition. The Dewey’s Readathon campaign page is here. To support the campaign and Room to Read, I will be donating 5 cents for each page I read. If you would like to match my donation, I will keep you updated on my progress here and on Twitter! 1) What fine part of the world are you reading from today? Oregon, where the coffee flows hot and strong and the rain never says goodbye for long! 2) Which book in your stack are you most looking forward to? The Long Way to a Small Angry Planet by Becky Chambers – I’ve heard a lot of good things about it! 4) Tell us a little something about yourself! Yeah, it’s 5am, all I’m thinking about is coffee right now. 5) If you participated in the last read-a-thon, what’s one thing you’ll do different today? If this is your first read-a-thon, what are you most looking forward to? Track my reading using the Bookout app (someone suggested it on Twitter). I’ve been participating in the #igreadathon challenge on twitter – one photo an hour for the whole event! Check my photos out here. So far, I’ve read Avatar the Last Airbender: Shadow and Smoke Volume 1, and am partway through The Lost Heir by Tui T. Sutherland. They’re both excellent! I’m enjoying coffee and muffins om nom nom. I finished The Lost Heir – it was wonderful! Tsunami grew a lot by the end of the book; she was incredibly annoying at the beginning. And I miss Clay’s POV. But yay, my dragon babies! I read the poetry collection Approaching Winter and didn’t care for it. I started The Long Way to a Small Angry Planet by Becky Chambers – it seems promising! I’m reading TLWTASAP v e r y slowly because it’s very dense and wonderful sooo, yeah. That might take the rest of the day. I took a short break to read Saga Volume 5, which was unsurprisingly disturbing and violent, wheeeee! My pal Amelia kept me company from hours 9-11 because she is a gem. I kept reading TLWTASAP and she read The Raven Boys. I finally turned on some music because I’m not always an animal, which was mostly instrumental on shuffle – so like, Haydn then followed by Captain America OST. Totally normal. I confess to relating to the character Corbin a LOT. He is grouchy and awkward and obsessed with rules. SORRY, IT’S ME. 3. What book are you most looking forward to for the second half of the Read-a-thon? A volume of Batgirl! 4. Have you had many interruptions? How did you deal with those? Yes, mostly of the social kind which is good! I am embracing them. 5. What surprises you most about the Read-a-thon, so far? I haven’t been too focused on challenges this time because I’m too busy reading. Usually challenges are my favorite part. I guess my book choices are just REALLY GOOD. I mean, I read some of TLWTASAP, but mostly I was making dinner, eating dinner, and then taking all of my readathon paraphernelia to a friend’s house where we had a READING PARTAYYYYY!!!!!! READING PARTAYYYYYY. You can see my photos on my instagram @bahnree. I kept working on TLWTASAP – I keep having to look up science words! So sad. But this book is GREAT? It’s just like super casual space adventures on a ship that tunnels through space/time. We ate too much food…my tummy is exploding….. I also read Batgirl: To The Death by Kelley Puckett (DC Reprint), which had crazy crazy art but I love Cassandra Cain so muchhhhh. I read The Wicked and The Divine: Rising Action and it was fantastic! Action-packed! Resolutions! I’m so psyched to see where these characters go next! Will they get therapy!?! I’m still reading TLWTASAP!!!! It is long and I am savoring it, okay! I have some small quibbles with it but overall it’s really enjoyable to read. Cozy, even. I think my main goal for the last couple of hours is to finish that….I might read a little of Gunmetal Magic if I have time. I finished TLWTASAP and fell asleep sometime afterward! 1. Which hour was most daunting for you? Hour 24, apparently. 2. Could you list a few high-interest books that you think could keep a reader engaged for next year? The Wings of Fire series by Tui Sutherland if you like dragons and enjoy books for middle grade. They’re really entertaining, well-written, and have amazing characters and friendships. 3. Do you have any suggestions for how to improve the Read-a-thon next season? Nope! 4. What do you think worked really well in this year’s Read-a-thon? I REALLY loved the instagram photo challenge! It didn’t take much time out of reading to participate and the prompts were fun. 6. What were the names of the books you read? See my updates above! 9. How likely are you to participate in the Read-a-thon again? What role would you be likely to take next time? I participate whenever I’m able! I’m doing the thing again. Dewey’s 24-hour Readathon is this Saturday, October 22nd. Reader sign-ups are here. I haven’t yet made it all 24 hours and I won’t this year either but I’ll be participating as much as possible. This will be the first time I am reading e-books only, as my e-book TBR is getting ridiculous and I recently learned that I read much faster on my Kindle. I may throw some comics in there, too, if the occasion calls for it. Are you participating? WHATCHA GONNA READ?